Suggested Use: Two tablets, one to three times daily. Take tablets on an empty stomach. SAM-e: If worn-out joints, cancer, or depression are making you turn to drink, this supplement could be just the ticket! SAMe (rhymes with Grammy) is an acronym for S-adenosyl methionine. SAMe plays a role in sulfur metabolism. protects against alcohol-induced fatty-liver disease. 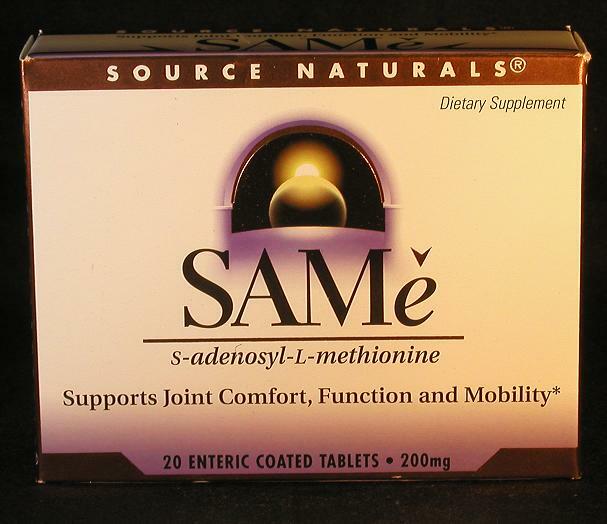 SAMe (often mispronounced unless spelled SAM-e) is an acronym for S-adenosyl methionine — i.e, the amino acid methionine linked to the DNA base adenosine. SAMe plays a role in sulfur metabolism. SAMe deficiencies would result from deficiencies of the factors or cofactors required to make it — methionine, choline, or B-vitamins. Low levels of SAMe may lead indirectly to lowered serotonin production in the brain, causing depression. Research studies show that supplemental SAMe elevates mood and reduces depression without such side effects as nervousness, headaches, impotence, and sleep disturbance. SAMe has also been shown to be beneficial in treating osteoarthritis, depression, and liver disease.